Mozilla announced that a new User Interface for the Firefox browser (code-named Australis) is now officially available for testing. According to the Mozilla wiki, Firefox 25 is still the targeted stable release to contain this new User Interface. The proclamation was made at the ongoing Mozilla Summit which is taking place at three different locations worldwide. The event is being attended by approx 2500 Mozilla volunteers and employees. The redesign of the User Interface promises to offer a cross-platform consistency – this essentially implies that the surfing experience shall be more or less the same irrespective of device being used to access the web via the Firefox browser. The new interface also promises to provide better customization which would give users a chance to choose how they access the web via the Firefox browser. Australis is currently available for testing here. Next articleGalaxy Note 3 Regional SIM Lock Bypassed, but what is it anyway? Which is Sadly not True. 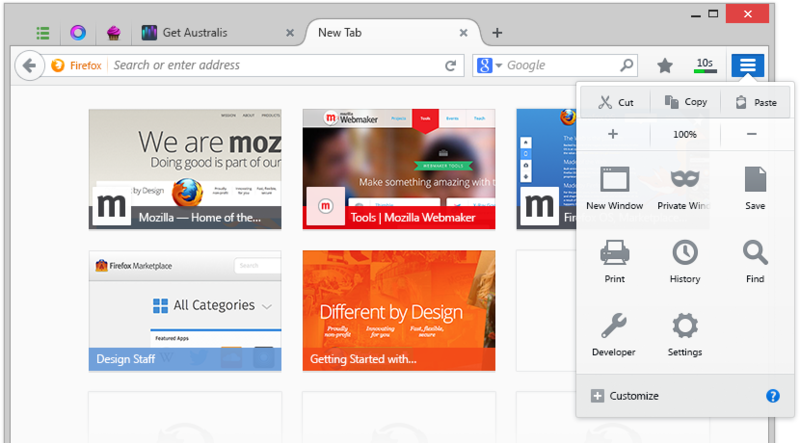 With Australis most In-Browser-Customization Options are going lost. Add-On Bar goes lost, you can not create a Navigation Bar Clone at the Bottom, Buttons are merged, you can not move them anymore in a seperate way, You can not move Navigation Bar Elements anymore in the Tabbar to combine Tabbar and Navigationbar. What is upcoming is some kind of Overflow Panel which adds all the Add-Ons which do have no place anymore on the Navigationbar. Australis new Customization is limited to move Add-On Buttons around in the UI – Similiar to Chrome. Who has tested the UX Versions, knows that it adds not more but removes most of Customization Options. And if you want some of them back, Mozilla expects you now to add add-Ons. Basic Customization Options should not be removed out of the Browser, we already do have Chromium, i just do not understand why Mozilla sees the need to create a second one. And Point 2 – it is just unnatural to merge Mobile and Desktop Versions in Design and Function, at least Functions stay different. What works on Desktop Machines does not always work on Mobile Devices. So why simplifying the Desktop Versions when it is only needed in the Mobile Sector. Mozilla should release 2 seperate Browser concepts, but it seems they have not the resources and manpower for doing that sadly!